Boston Audio rentals and services all special events and is a full-service AV Rental company providing Audio Rentals, Lighting Rentals & Video Rentals and services. 24 Hours 7 Days a week our phone system goes directly to our staff anytime, anywhere we are, to support your needs. With a vast diversity in equipment and experienced Audio Visual staff we have enabled our clients to run successful events since 1999. Producing over 600 events a year, we can help you through every step of the process from the initial ideas, to planning, logistics, and execution. Use our site as a tool to start your rental request or contact us anytime for immediate help and detailed needs! We are happy to share with our clients our decision to acquire the world renown manufacture L-Acoustics professional speaker lines. 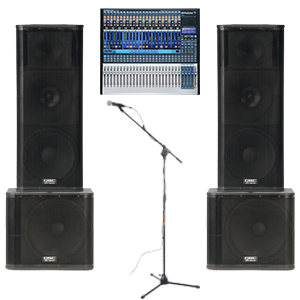 Boston Audio is now able to supply the best sound possible. The L-Acoustics way is not just any manufacture, there is a methodology and practice which Boston Audio is proud to be a part of. Experience the latest in L-Acoustics and learn why it’s called the Best. To find out more about the brand visit L-Acoustics.com, to find out more of what we offer take a look at our inventory and what we can do for your next show! Order any av rental package $1000 and more and we got you covered in the greater Boston area! Delivery and Pickup will be included as long as you mention this special. Give our sales team a call at 877.354.2839 and we will send you some love on the road!